IFIC bank ltd job circular 2019. Bangladesh ific Bank Authority has been published a new Vacancy On Thier Official Website www.ificbank.com.bd. You Can Also See ific bank job circular 2019 on Our Online Jobs and Education Portal edujobbd.com. ific Jobs Candidate Can also Free download IFIC Limited Job Application, Admit Card, Jobs Questions- answer, Written Exam Date, recruitment result 2019 here. ific bank job vacancy is Good News For Bangladesh Bank Jobs Seeker. Because of Every SSC, HSC, Honours, DEGREE, MA National University Student Want to Join Bank Sector. IFIC Bank Jobs New Circular- www.ificbank.com.bd. Hello, Bd jobs Seeker, IFIC Bank Limited Job Circular 2019 Announced By The ific bank recruitment result Authority. IFIC Full Meaning International Finance Investment and Commerce. IFIC Bank Bangladesh Limited was set up at the instance of the Government in 1976. This online Bank setting up joint venture banks/financial institutions aboard. the Government allowed This IFIC banks in the private sector In 1983. IFIC was changed into a full-fledged commercial And Marketing bank.The Government Of Bangladesh now owns 32.75% of the share capital of IFIC Bank. 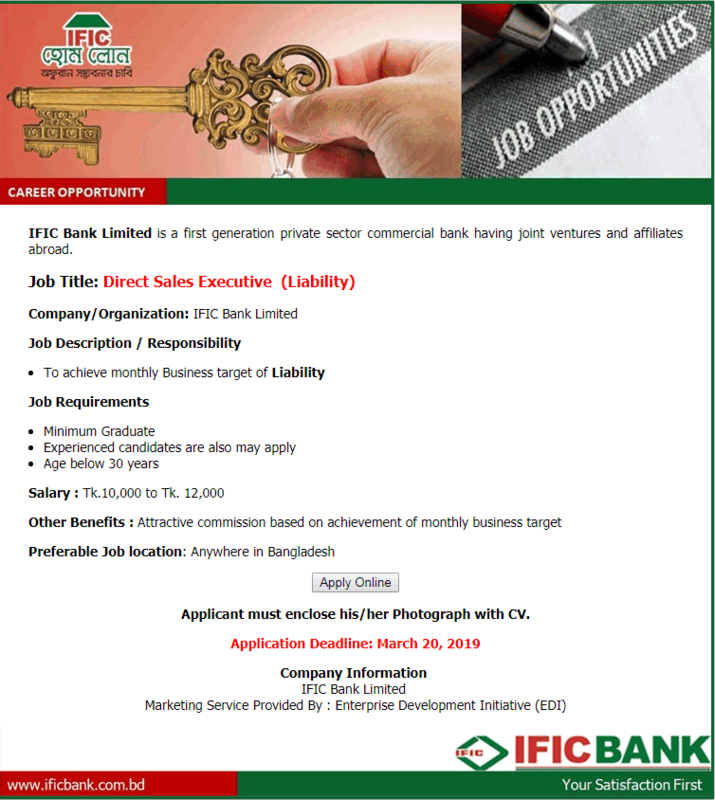 IFIC Bank Career Opportunity Bangladesh 2019 Details below. Publication Date: 11 January 2019. Educational Requirements: Masters with Honours in any discipline with minimum three 1st Divisions/ Classes/ Equivalent CGPA having no 3rd Division/ Class/ CGPA entire academic career. Job Experience: As per circular. Age: Age at most 30 years. Salary: As per Bank Circular. ific bank bd Circular For Bank Jobs Seeker-ificbank.com.bd. hey bd bank Job Article Reader, We Upload Career Opportunity Of IFIC Limited bank Jobs Circular As Jpeg File. See below. I think You read our Ific bank Ltd Job circular Fully. Now Should Apply As Fast As you can. if bank full meaning International Finance Investment and Commerce Bank Limited. This is a banking company organized in Bangladesh with Company liability. Are you know, IFIC was transformed into a full-fledged business bank. Its Good news that The Bangladesh Government now holds 32.75% of the share capital of the Bank. Directors and Sponsors having large knowledge in the area of trade and commerce own 11.31% of the part capital and the rest is supported by the general public.